There are not many who knew that a winery operated for years on property which today is now part of the historic National Battlefield Park near Manassas, Virginia. The winery was discovered after a single, partially-full, and well-preserved bottle of wine was brought to the attention of this writer in 2002. Little is known about the Winery and its owner, John Sciutto, other than he was in real estate prior to starting his winery in 1949. He emigrated from Italy in 1931 to “get away from the Fascist Government of Mussolini” reports writer Aubrey Graves, who wrote for the Washington Post during the 1950s. Graves, known as The Squire of Grigsby Hill, published five articles for the Post from 1953 to 1956 about the Sciutto and his winery. .
Sciutto made his wines the old fashioned way “…all grape juice – no water, sugar, alcohol or chemicals are added”. Sciutto further told Graves that his wine …”carries authority ranging 10-13 percent.” How Sciutto made the wine was the old fashioned way as he revealed to Graves for one of his articles – “We use feet, pretty girls feet, to crush ‘em.” These grape stomping performances included models from local area modeling schools and for at least a couple of years became annual celebrations. At each event, the blessing of the fruit was first, then the grape stomping, Italian food buffet, and of course the sampling of the previous year’s vintage. Senators, Generals, Congressmen, Judges, and even the Italian Ambassador were known to have attended Sciutto’s popular annual celebrations. 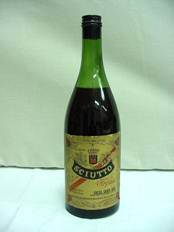 Sadly, in the fall of 1955, the Sciutto Winery lost its license to make wine due to either bad wine or bad bookkeeping. A stroke be felled Sciutto and after his recovery and interminable weeks of red tape, he convinced the authorities to re-sample wines he had aging in barrels. His license was restored, but Sciutto was emotionally exhausted. Before he could take up his work again; a second stroke came. 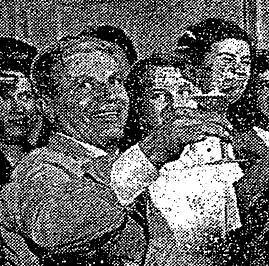 In his final article Graves wrote in 1956, that the doctors called John’s strokes, heart attacks, but close friends of John diagnosed him more specifically as “heartbreak failed the proud little Italian.” His health diminished and his heart too broken to make his wine any more, the Sciutto Winery turned into a grocery store. John Sciutto’s fatal day came on February 15, 1958 when he was involved in a car accident during a snow storm just a quarter of a mile from where the Sciutto Winery once stood. Doctors said it was a third heart attack that took the vintner’s life that fatal day. Sciutto was buried in a Manassas area cemetery but no headstone marks his grave – a very, very sad ending to the life of John Baptista Sciutto, the wine maker. 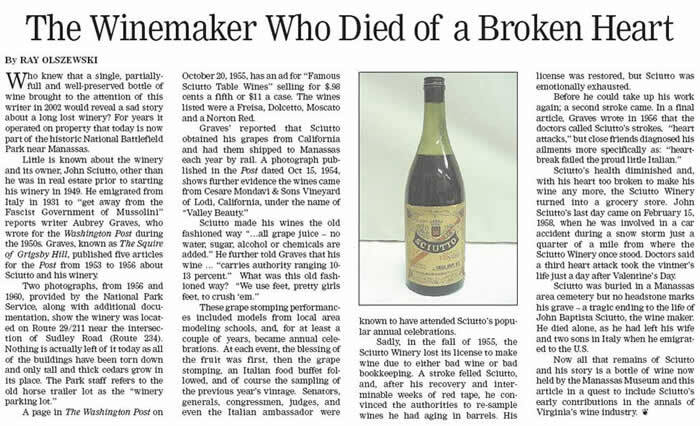 He died alone, as he left his wife and two sons in Italy when he emigrated to the U.S. Now all that remains left of Sciutto and his story is a bottle of wine now held by the Manassas Museum and this article in a quest to seek acknowledgement for Sciutto’s contributions to Virginia’s wine industry. In Vino Veritas” ~ “In Wine There Is Truth.